First week of the new job, mission accomplished – complete with a snazzy new bio. Check out that classy head shot. Actually, I realized upon scouring my computer for an acceptable image that finding a professional picture of myself is super hard. See exhibits A and B below for further proof. I’m one of those recluses who does all my Christmas shopping online. My heart cannot even take the trials of navigating a parking lot (and subsequently narrowly avoiding my poor little car being squished by lunatics five times over) this time of year. I seriously needed to go grocery shopping today, realized it was the Saturday before Thanksgiving, and decided “Nah, tomato soup out of the can with a salad of slimy, past-expiration-date lettuce sounds fine enough to me.” Plus, I have friends and family with distinctive tastes and it’s often hard to find unique gifts that they’d actually like or don’t already own in stores. If you are like me and prefer to sit in your pajamas drinking hot tea while scouring the web for unique gifts, you should check out my redbubble shop. I have a ton of fun and whimsical seasonal designs posted, and also a variety of awesome designs for year-round. I also have my first calendar ready for print. Having a calendar hung up on my bulletin board is literally the only way I know what day it is. Plus, when the year is over you can get crafty and turn the pictures into awesome art. New items for the holidays have also arrived at the Moongirl Designs Zazzle Shop. In my opinion, you can never have enough ornaments. When I am done decorating my tree, there is pretty much no green left to be seen. I have fun illustrated Christmas character ornaments on zazzle : Santa, angels, elves, all the nostalgic classics illustrated with a new twist. I wish all of you in the states a wonderful Thanksgiving this upcoming weekend, and for those going out on Black Friday … Godspeed to you – try not to get trampled. 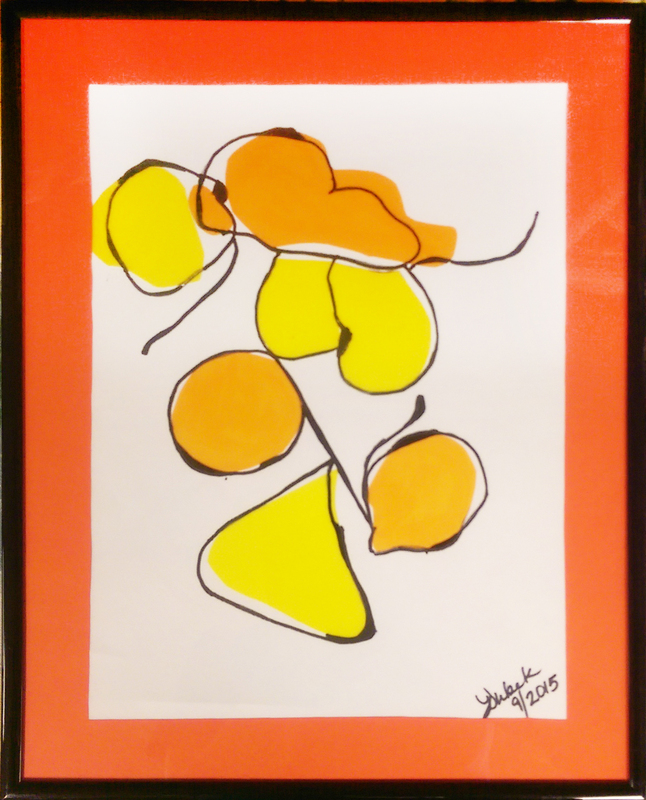 Many of you who have read my blog before have probably heard me talk about Express Yourself Artshop, an art and wellness program open for adult students of varying abilities, especially those with disabilities. Artshop is one of the programs I have taught with since its beginning a little over 2 years ago. Our Program Coordinator moved out of town last month, and being that Artshop has always been my favorite out of all the programs I teach with, I applied for the position. This week it is official, from now on I will be with Artshop full time. I have a lot of ideas, a ton of brilliant people helping me, and I cannot wait to see how the program grows and evolves. I dare you to watch the video below and be in a bad mood. Life is funny, and I never ended up actually working “officially” in the field that I went to college for, but am now doing something I never would have imagined. I’m not one for cliches but the old saying “Knowledge is never wasted” certainly rings true, and I see my interior design background creeping in in little ways throughout my current work. In my new DIY Decor class this semester, I’ve been exploring creating classy, elegant and beautiful decorations for the home using cheap, everyday materials. 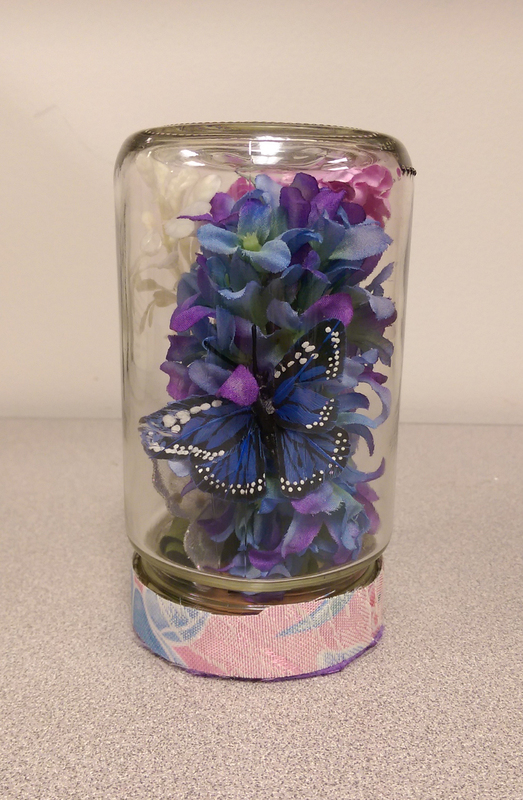 My students and I have combined my two loves; stylish and artistic decor, and recycling, or up-cycling in this case (basically never wasting anything). They have blown me away with their fantastic vision and their own unique style that they bring to the projects. There is a lot going on, and I’m excited to share more with you in the coming weeks and months. 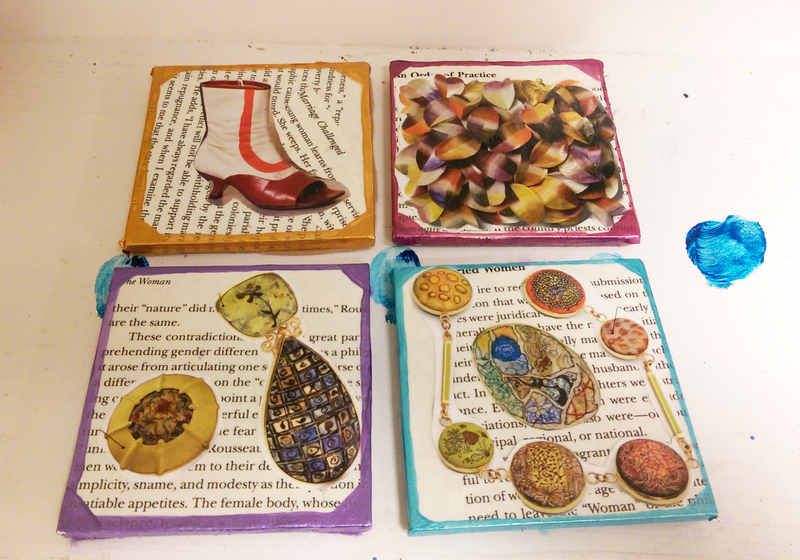 Coasters by Lori : Wood Samples (It pays to have a boyfriend who works at a furniture store ;)) covered in book pages and magazine cutouts, accented in metallic acrylic. Felt is applied to the bottom to prevent scratching. Sealed with mod podge aka my lifeblood. Salt and Pepper Shakers by Amber : Empty glass spice jars with holes punched in the lids. 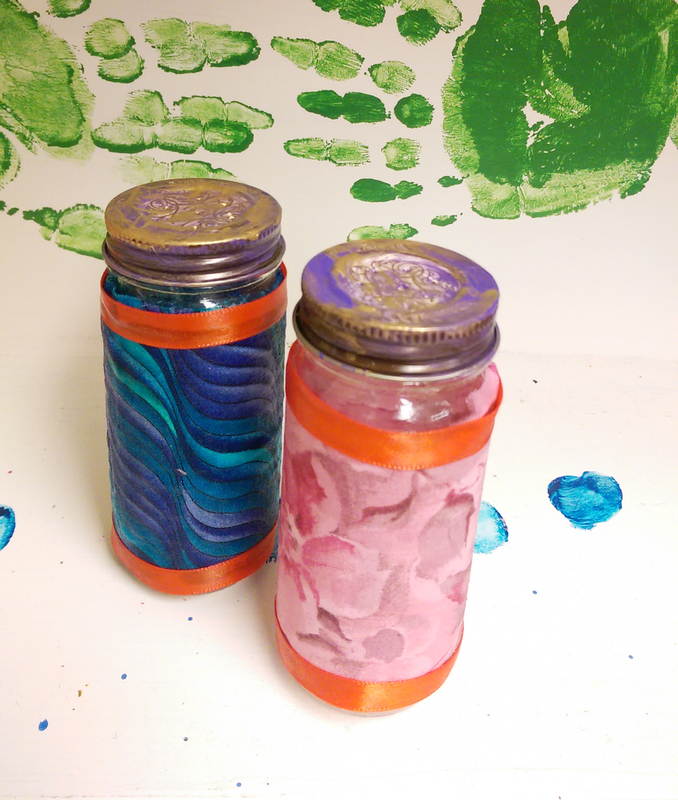 The tops are painted with enamel and the jars are wrapped with fabric and a ribbon accent, sealed, again, with mod podge. Decorative Terrarium by Colleen : It’s amazing what you can do with an olive jar, some fake plants , ribbon, and raffia. 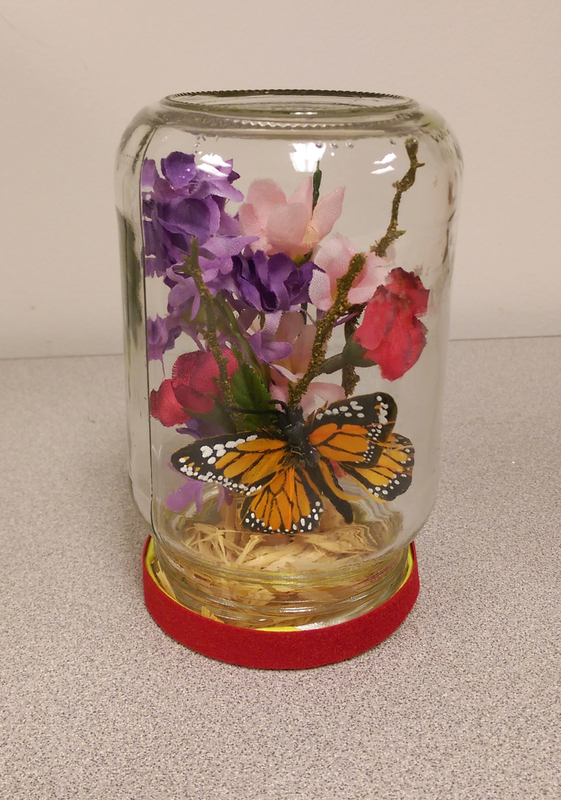 Decorative Terrarium by Michelle : All you need is an empty salsa jar, some fabric flowers on stems, ribbon to wrap around the lid base, and a little bit of creativity.